Historian Erik Kwakkel has spent years at Leiden University in the Netherlands examining some of the world's oldest books and manuscripts. He's fascinated with "pen trials"—small sketches drawn by medieval scribes testing the ink flow of their quills. Among his discoveries: the smiley face goes back centuries. In some sense, these sketches are like fingerprints or signatures, little clues that reveal a bit about these long forgotten scribes who copied texts but who had no real opportunity to express themselves while working. Including additional sketches or even initials in these books was often forbidden. While many of Kwakkel's discoveries are standard pen trials, other doodles he finds relate to a human concept as universal as topics discussed in these 13th and 14th century books such as love, morals, or religion. Specifically: boredom. It seems the tedium of reading through a philosophy textbook or law manuscript dates back to the very invention of books. Some of these scribbles were even made hundreds of years after a book's publication, suggesting no margin is sacred when monotony is concerned. 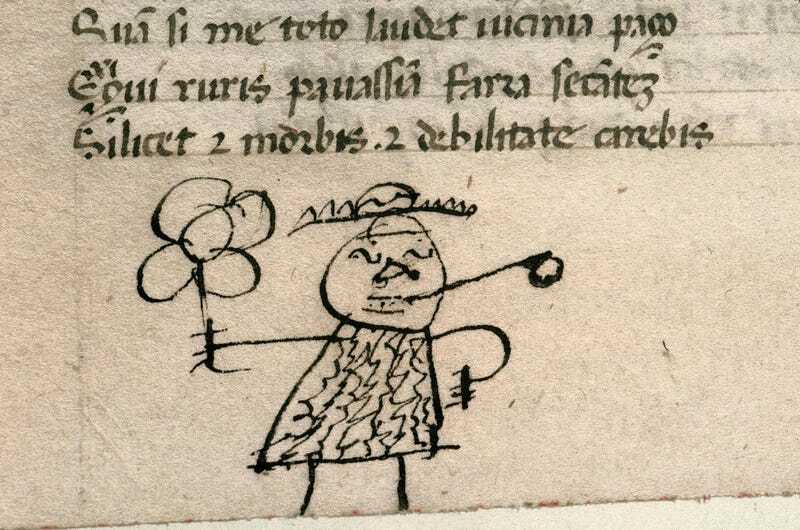 See more medieval doodles at Colossal and on Kwakkel's Twitter feed.